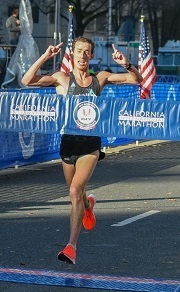 Brogan Austin is the current U.S. Marathon Champion with his 2018 California International Marathon victory in only his second marathon with a come-from-behind race that he won by 21 seconds in 2:12:38. Brogan’s first marathon was a 38th place finish at the 2016 U.S. Olympic Trials Marathon which he qualified for with a sub-1:05 half marathon. 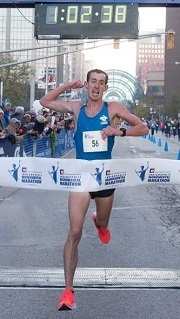 He won the 2018 Indianapolis Half Marathon in 1:02:39. Austin graduated from Drake University in 2015 where he was a six-time Missouri Valley Conference Champion (three indoor 5,000 meters; one indoor 3,000 meters; one outdoor 5,000 meters and one cross country). He won the 2013 Drake Relays 5,000 meters. At Boone (IA) High School Brogan was 2009 Iowa Class 3A State Cross Country Champion and won 2010 State titles at 1,600 meters and 3,200 meters. His personal best times include: 1,500 meters - 3:52.18; Mile - 4:13.36; 3,000 meters - 8:16.89; 5,000 meters - 13:59; 8k Road - 23:43; 10k Outdoor - 29:32.97; 10 Miles - 47:57; Half Marathon - 1:02:39 and Marathon - 2:12:39. He earned multiple Missouri Valley Conference Commissioner’s Academic Excellence awards and MVC Academic Honor Roll citations. He works for Berkeley Technology and lives in Des Moines, Iowa. Brogan was very generous with his time as we spent an hour and forty minutes on the phone in early 2019 for this interview. GCR: Congratulations on your winning the U.S. Championship at the 2018 California International Marathon. With over a month since winning to reflect, what are your thoughts and emotions after winning your first marathon and in doing it on the national championship stage? BA First, thanks for speaking with me and I look forward to our conversation. It’s been a whirlwind to say the least. With regards to the marathon, or just winning a race in general, it is always a special treat for anyone who gets that experience. I feel like the marathon is somewhat sweeter because it’s such a rare occurrence. Most runners compete in a marathon maybe twice a year, though there are those people who go a little crazy and run ten or twelve marathons in a year. This was only my second marathon. I had an inkling that I could win a marathon, but to do so is a dream come true. Winning a national championship and winning a marathon knocks a couple things off my bucket list very quickly. I’ve now had some time to absorb it and things have calmed done a bit. I’m still trying to enjoy the moment. GCR: Before we delve into details of the race, when we look at the big picture, was it even more gratifying to win a race by biding your time, running your race back in the pack and then making a strong effort to move up to try and win the race in the final mile and to have your strategy work? BA It honestly feels like I was spoiled a bit. It’s like the story of the horse, Seabiscuit, where it couldn’t have been any better. I stuck to my guns and what I know I’m capable of and what my coach and I discussed. We talked about someone maybe going out early and being patient with the race. The race course is somewhat difficult the first half but overall is an easy and fast course in the second half. So, we wanted to be conservative and go out the first half around 66 minutes and then to close it out in the second half. To draw up a game plan like we did, go through with it and have everything happen as we expected rarely happens. Once in a blue moon everything goes according to plan. I was lucky enough to have it happen on that day. GCR: Matt Llano pushed the early pace and built a big lead by halfway with Sergio Reyes and Wilkerson Given the first to give chase while you stayed with a huge chase pack of perhaps twenty runners. Was it tempting to go with Reyes and Given or did you just maintain composure because there was still a lot of ground left in the race? BA That was a huge thing for me. I had to ignore my ego, hold back and let those guys go. Early on, as soon as those guys made that move, I wanted to go with them. But I knew what a beast the marathon is, and I didn’t want to be the guy who went in no man’s land by himself and ended up blowing up. In a previous C.I.M. race, Parker Spencer had gone out early by himself and ended up blowing up. The marathon is a long, grueling race and the more efficient you can be and the more energy you conserve, the better off you are. I had to reassure myself many times that it was a good idea to stay with the pack. I sat back in probably tenth or twelfth place the whole time, trying to draft and conserve as much as I could. There were many times I wanted to go off on my own. I felt the pace was lagging a little bit when we had a couple of slow miles. But I kept trusting the process and everything worked out. GCR: Since you came through the half marathon around four minutes off your PR at that distance which is 15-20 seconds slower per mile, did you feel very comfortable and almost effortless at that point and was this why you were wanting to go and take off? GCR: Can you describe your thoughts in the final 10k when Llano started fading, you led the surge to catch Reyes and then set your sights on Llano? And then how you were able to drop your pace in the last 10k with miles of 5:07, 5:01. 4:58. 4:52. 4:44. 4:43 and the last two-tenths at 4:46 pace? How were you feeling mentally and physically – did you have a lot of energy or was it tough to maintain the effort and you had to dig deeply? BA That’s a fun question for the marathon because we have so much time to think about everything. We’ve got about two hours to question what we’re doing and all the things we didn’t do right and the things we should do right in the latter miles of the race. I was constantly questioning myself and trying to be as smooth and as relaxed as possible. Moving into the latter part of the race I remember hitting mile 18 and thinking, ‘Okay, this is when the race starts.’ The first half was everyone prancing around and wearing down our legs, but at mile 18 it was go time. That was where we don’t talk the talk but walk the walk. Some people made moves, but nothing too drastic. With about five miles or 10k to go, Bredan Gregg and Martin Hehir started pushing a bit, but not too much. Still, I could feel my legs hitting a wall. I was lead-legged, and it felt harder to pick up my legs. Everything felt more lethargic. I remember giggling during the race and thinking, ‘This is the marathon here and now the race starts.’ Matt was so far ahead. I think after 5k we didn’t see him because he was so far in the distance. Or maybe I wasn’t aware of him. I didn’t think it was possible to win the race at that point. I wasn’t even considering winning. I was trying to run as well as I could and to run a fast PR for the day. With about 5k to go I decided it was time for me to go and I closed better than I thought I would. With every step and every mile, I was gaining more confidence and feeling better. I felt the adrenaline and it wasn’t until about mile 25 when I caught the second-place runner that I could see Matt off in the distance and he was just coming back to me quicker and quicker. I hadn’t seen him until that point, so I knew he was blowing up. He ended up coming back to me pretty fast in that last mile. GCR: I’ve raced fifty marathons and often towards the finish I found I psyched myself up with thoughts like, ‘It’s only another 5k’ at 23 miles and then ‘Just run one mile’ when I hit the 24- and 25-mile markers. Were you finding that you segmented the final stages of the race and talked to yourself to stay positive? BA Yes, there was a lot of mental talk going on throughout the race. It’s an interesting perspective that you bring. For me, I was focusing more on not blowing up. I know that in the marathon your body can just say, ‘Okay, I’m done. We’ve tapped out and depleted our energy sources.’ I felt like there was more in the tank, but I was trying to be conservative and not blow up or cramp. I just felt like my body was very fragile at the time and there was a ton of mental talk from mile 18 onward because I knew everything would become a lot more sensitive. GCR: How enjoyable was the final minute or so when you approached the finish with the knowledge that, unless something crazy happened, you were going to win? GCR: What were the emotions you felt when you broke the tape and then again on top of the podium where you were on the highest step and being on any step was a dream? BA I remember crossing the line and being so pumped and high-fiving anybody I could in the crowd. I was just elated. Even today, when I randomly think about it, I can’t believe that I did it. It’s just been awesome. To come into the race as the guy no one had ever heard of is almost comical. Matt had a great race leading from the gun and running out there by himself which is extremely hard to do. To nip him at the end and go up on the podium are moments I relive and will never forget about and that’s not a bad thought to have. GCR: From what I read, you were experiencing some sickness in the days leading up to the race. How did that affect you and how close were you to not even racing? BA That was a huge concern for me. In the weeks and months leading up to the race, that is everyone’s nightmare. I just wanted to be healthy for that one month prior to the race. I wasn’t asking for much. I would even be fine being sick for two months after the race as long as I was healthy when I got to the staring line. And, of course, two or three days before the race I woke up and had this sore throat. I couldn’t talk and my heart sank. I thought, ‘You’ve got to be kidding me.’ I went to the doctor right away. I wasn’t feeling good. In the next days after I woke up with the sore throat, I felt super tired and lethargic. The worst I felt was on the day before the race. I was thinking that everything was just going to go down the drain. I was very worried and disappointed that I had put in all this work for the past six months, I was in phenomenal shape and it was all going to go down with this silly sickness three days before the race. The morning of the race I woke up and thought, ‘I think I actually feel right. I feel normal. I think I’m going to be okay.’ Then instantly my mindset was, ‘We’re doing this. I’m in great shape. No excuses. Let’s put it all on the line and let’s go get a National title.’ I wasn’t as confident as I portrayed, but we discussed that self-talk and I did have two hours to think about it. But I felt good the day of the race and that was all that mattered. GCR: Other people may have had you off the radar, but you had some good races in 2018. You really made your mark on the U.S. distance scene with your 1:02:39 Indianapolis Half Marathon 2018 to take first place. What did you do in training to have this breakthrough? Did you surprise yourself a bit to be in the 1:02s or did your training indicate you were ready to go that fast? BA I was super surprised because I had had some time off. I have battled quite a few injuries and had trained myself for a while. I knew there were some things I needed to do to make myself, per se, into a perfect runner. I knew from prior workouts and prior races that, if certain things hadn’t gone wrong, I could have achieved bigger things. So, I knew I was in probably 63:20 shape and 2:15 shape before I stared training with my new coach, Tom ‘Tinman,’ Schwarz. He took me to a whole level more than I ever imagined I could reach. And I made those gains in a relatively short time period. Within three months I was running on a completely different level compared to before. I had no idea what kind of shape I was in and it wasn’t until the races and when I tapered my training that I realized I was in insane shape. I was doing things I never thought were possible. 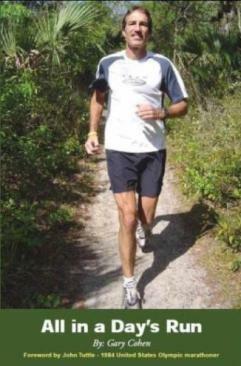 It wasn’t until that half marathon that I really believed in the training and knew I was in great shape. As soon as I ran that 62:39 I thought that I should have signed up for the Houston Half Marathon instead of the marathon I just ran. I knew I could break 62 minutes on a fast course like in Houston and I was on top of the world. But I had committed to this marathon and thought, ‘let’s just do this.’ There were unknowns in the training because I wasn’t doing anything that was marathon-specific or any marathon type pace work. I was questioning whether I would be ready for the marathon. Nor had I practiced nutrition at the level needed for a marathon. There were many unknowns and I was questioning whether I should go through with this marathon. I had just ripped a great half marathon and I thought I could run quite a bit faster. Ultimately, I talked myself into the marathon and stuck to the plan. The stars aligned. GCR: You also improved your ten-mile PR substantially with a 47:57 time at the USATF 10-mile in Minneapolis in October 2018 even though you cramped up in the last few miles and would have been even faster. Was this just another indication of your fitness for your big marathon race? BA That USA Championship was the first inkling that I was in good shape. To this day it eats me alive because I wish I could have fully finished that race. But, ultimately, I cramped up at mile seven and had to coast in. There were many big-name athletes that I know I can compete with. I can talk the talk, but until I can walk the walk it’s not true. I was disappointed because I felt great that day, the weather was perfect, and I think I could have done well, though ultimately it didn’t happen. It does make me hungry for the future. I want to race those guys again. I’ll try to seek them out and prove to myself and to the world that I can compete with the best guys in the U.S.
GCR: Let’s discuss some elements of your recent training. First, what does your average weekly mileage top out at for a period of base building for a marathon? BA Most of the time I hover around ninety-mile weeks. Depending on whether I have a race coming up, I will drop the mileage to 75 or 80 miles that week. If I’m able to squeeze in a good chunk of training, then I can get over a hundred miles for the week. I do nothing astronomical. It’s moderate training and I never felt like my legs were tired from running too much. GCR: How long are your long runs, how many do you do, at what pace or intensity and did you do any with a fast finish? BA For the most part they were at a moderate effort. I think I remember reading that Frank Shorter used to shoot for under six-minute pace on his long runs. Most of my long runs were under six-minute pace. I didn’t force anything. I wasn’t trying to hit a specific pace. I knew the mileage I had to hit, and I just wanted to give a moderate type effort. It usually worked out that I was under six-minute pace. My longest run was about 24 miles, but I only did that once. Other than that, my next longest run was maybe 22 miles. We did a lot of two-hour to two-hour and ten-minute long runs and it usually worked out to be 20 to 22 miles. GCR: What are some of your favorite stamina and tempo sessions? Do you do repeat two-miles or repeat 5ks and are they usually on the road or track? BA My personal favorite workout is long tempos. But my new training doesn’t allow for long tempos. We do a lot of fartleks at various paces. They could be at mile, 5k or 10k paces. The longer the workouts are and the longer and slower the pace for the reps are, those are my favorite workouts. We will do threshold workouts and those are usually easier for me than mile-paced efforts. They don’t cause as much hurt and I’ve always had an affinity for that training. GCR: You tend to do more treadmill running than most top distance runners. What do you do and why do you like treadmill running? BA I try to do all my easy days and my long runs outside. But whenever I have interval training, I always hop on the treadmill. It allows me to be very precise in my training and it also allows me to keep a consistent environment. First, I can see out my body feels and understand if it’s going to be a good day or a bad day. Then I can adjust accordingly. Second, I have a training partner and it’s big to have someone or something to push me. When I’m outside doing workouts by myself, it’s not always easy mentally to put myself in pain. With the treadmill setting the pace for me, I can sort of zone out. There are TVs in there so I can watch Jeopardy or ESPN or some sort of fun station to get my mind off the pain. I usually have way better workouts on treadmills because my environment is consistent, and I can get my mind off the hurting of the workout. I had to start doing it in college because I couldn’t run on our indoor track. It was a 150-meter track and then it was icy outside, so I started doing my workouts on the treadmill. I found I liked that part of it and ever since then I’ve been hooked. GCR: To keep top end speed and efficiency do you incorporate speed sessions and hill repeats in your training regimen on a regular basis and, if so, what are some of your ’bread and butter’ workouts? BA I think it’s extremely important to do some quicker running at 800-meter pace or mile pace. Short hill sprints are very important to keep our running efficiency and running mechanics. At our peak, when we are sprinting, we can be more deliberate about having good form and it makes us more explosive with the toe-off and driving phase. Then when we are running more slowly, it makes it feel so much easier. It feels like I’m floating at 4:40 mile pace when I’m used to running 4:00 pace. I feel like that’s a big component of my training – doing the quick running to make the slower training feel easy. GCR: When I interviewed Henry Rono, the former world Record holder at all distances from 3k to 10k, he said we can do long hills, short hills, hill repeats or run hilly courses, but whatever we do, if we have some hills in our training then we will race faster. So, do you have specific hill training or just hilly stretches of your distance running? BA I usually incorporate a short, steep hill. Those are important because they force me to have better running economy. When you run fast on flat ground there is an impact, but when you run fast up a hill it lessens the impact on your legs. On long runs I have a difficult long run route that incorporates short hills, long hills and steep hills. It’s a gravel road that I always include on my long run. It adds extra flavor, breaks up the monotony with those little milestones and can make you hate yourself a little bit. GCR: You mentioned earlier about how you started working with Coach, Tom ‘Tinman’ Schwarz. What would you say are the key items in training, racing focus or holding back that has helped you to be better prepared to race and to execute your race plans? BA There are two pieces that Tom helped me change. The first is undertraining. I over trained in college and undertrained too much after college. Tom helped me find that medium route. Someone called it the Goldilocks amount of training – not too much, not too little, but just right. The other component is being a well-rounded athlete. A runner can’t be good at just one distance. You should be good at any race on any given day. It allows you to stay healthier. When you work the same muscles over and over, they get over worked. You don’t find balance in your mechanics. When you are working 800-meter pace up to half marathon pace, you’re working different muscles. I think that helps with injury prevention. Also, when you are running workouts that are complementary, the shorter workouts build efficiency and running economy and make the slower workouts feel easy. When you run the slower workouts for a long distance, it builds aerobic capacity and allows you to hold the fast pace during the shorter workouts for a longer time. It’s super important to find balance in your training – whether it be in the amount of workload you take on and the types of workloads. GCR: Let’s go back to you formative running years. As a youth you were involved in other sports like baseball and wrestling. How did these other sports help you to be balanced as an athlete and not to get burned out like some teenagers who focus only on running? BA I played baseball, a little bit of football, wrestling, track and cross country. I spent the longest amount of time with wrestling, track and cross country. Wrestling was super complementary to distance running. I always gained about ten pounds every year during the wrestling season. I would lean out from cutting weight but put on muscle from grappling around with other wrestlers. That helped with my running because I had to be lean and strong and the power to weight ratio was helpful to me when I wasn’t running much. Running wasn’t my focus until my senior year. I had a coach reach out to me and he said, ‘If you’re going to be serious about running, you’re going to have to give up wrestling.’ That man made me the happiest man in the world that day when he told me I could quit wrestling. I had got to where I couldn’t stand it, but I always came back for more because I felt like it was a part of my identity. I absolutely hated the wrestling workouts and the weight cutting. It wasn’t fun at all. However, I feel like wrestling was one of the most important life experiences I had because it helped me to know I could be deliberate and make sacrifices. I realized what it felt like to hurt and to be mentally tough. I also learned a lot about diet and nutrition. I wouldn’t take wrestling back for the world. It has helped my running career. GCR: It’s interesting that you weren’t totally focused on running, but your sophomore year you were conference 3,200-meter champ and then your junior year were eighth in state cross country and took the distance triple in conference before a state second at 1,600 meters and fifth at 3,200 meters. Were you starting to notice that you were coming into your own and had quite a bit of ability despite running not being your sole focus? BA I had a lot of luck my junior year of high school. I didn’t have anything that pointed to me being a rock star in running. I had some success, was better than the average runner, and I knew that. But I didn’t commit full time. I had some breakthrough races and got a PR at 1,600 meters by about ten seconds at State. I went from something like a 4:35 guy to a 4:25 guy. That’s what got me recognized by the coach who reached out to me and independently coached me. That’s when it took off. I used to run 20 to 25-mile weeks until the independent coach took over and took me up to about 70-mile weeks and I got way better. I’ve had so much luck in my running career that it’s been ridiculous. It’s a combination of lucky happenings and being in the right place at the right time. I couldn’t thank everybody enough. GCR: What was your independent coach’s name and what were some of the other elements of training he emphasized to help you step up your game? BA His name is Ben Tillis. He had the same thing happen to him in high school and college where a coach reached out to him with some good running philosophies. So, he coached a kid before me and took him from being a nobody to a kid who won three State titles. I remember distinctly that kid and I always duking it out one year. Then the next year he blew my doors off by a minute in about every race. I was wondering how he got so much better. Then the coach reached out to me and told me he had coached the other kid. So, I basically said, ‘Yes, let’s do this.’ The biggest thing is we incorporated a lot more hill training. We would do short 100-meter hill repeats, long 800-meter hill repeats and long six to eight-mile tempos. We were deliberate about working on my systems and it got me to a new level, a Division One level. GCR: You mentioned Coach Tillis coaching your rival to three State titles. Your senior year you won three Iowa 3A State championships in cross country and on the track at 1,600 meters and 3,200 meters. Did you take the races out or use a strong kick to win? BA Those races were huge for me. All three were very close races. For background, in track we have the Drake Relays and they take the top 24 runners in each event without it mattering your school’s class. If you are in the top 24 in the State with your time, then you compete. I qualified my senior year and I ended up getting second in both the 1,600 meters and 3,200 meters. I was so frustrated. I wanted to beat those guys. My coach catered my training toward beating those guys at State because they were both in my class. I was the underdog in the 3,200 meters because one guy was the defending State champ and the other guy had won the Drake Relays. On paper they were both better than me, but I ended up having a great weekend. In the 3,200 meters, I ended up closing in a 2:02 final 800 meters and my last 400 meters was 56 seconds. For the 1,600 meters, I did the same thing and closed in 56 seconds. GCR: These performances must have generated interest from college coaches, so how did you decide to go to Drake? BA That’s when my phone started to ring and all the college coaches started calling, but it was a little too late. I had committed to Drake the day before the meet. I was still naive to the sport, so I didn’t know the process of talking to other coaches. I had signed the letter of intent the day before State. They were smart and were pushing me. They told me I had to sign if I wanted to come to Drake. Nobody wanted me before that weekend, but there was a lot of interest afterward. Still, it worked out for the best. GCR: Let’s move forward in time and discuss some of your collegiate racing. At Drake your freshman year you placed in the top six in some Missouri Valley Conference races and a got a second place in the 10k at the Drake Relays. Did your training change much in college and what did your collegiate coach do to help you improve and adjust to college running and life? BA It was an easy transition for me to go from home to college because it was so close. As far as training, I had a huge ego. I did what I did at that State meet and I thought I was top dog. I came to Drake and was our best runner. We were doing easy workouts relative to what I was doing before, and I guess that didn’t sit well with me. I had my arrogance and I just tried to implement the same training philosophies I had in high school. I got carried away with it and, ultimately, that was my demise. I burned myself out and over trained and did way too much. I had smart coaches, but I didn’t trust them like I should have. I had some early success in college. I was one of two true freshmen to qualify for NCAA Regionals in the 10k along with Parker Simpson out of Oregon and that gave me a little arrogance as well. I took things too far. GCR: Your sophomore year you won the MVC cross country title and indoor 5,000 meters. Was this doing even more to give you a big head? And what happened that thwarted continued improvement that outdoor track season? BA On the day in cross-country I felt good and got lucky. I think the training I was making myself do was getting harder and harder each year and my sophomore year was the threshold of it being too much. After I won the conference in cross country and the 5,000 meters indoors, I got too carried away in outdoor season. I ended up getting mononucleosis. After I got mono, I never recovered. I got way too carried away with my training and kept beating my body down and down and down. I got chronic anemia. I just never felt normal. I always felt depressed and always felt tired. I just ignored the signs and tried to dig deeper and train harder because I had all these aspirations of being good. My idea was to train harder. Hindsight is always twenty-twenty, but when you’re in the moment you just want to be good again. I wasn’t running PRs, wasn’t having any success and was losing to runners that I wasn’t losing to before. Ultimately, I never won another cross-country title again. I got lucky and won a few other titles. GCR: In Iowa a particular goal of runners is to win at the Drake Relays. In 2013 you claimed the 5,000 meters at the Drake Relays with a personal best 14:12.50, so how exciting was that and were your parents there watching? BA My parents were there, my friends were there, my college teammates were there, and my college friends were there. That was the pinnacle of my running. For me, usually when I did achieve an accomplishment, it wasn’t as exciting as I thought it was going to be. I was always looking toward the next big thing. Or when I set a new PR, I was again looking for the next success. That Drake Relays finals though was the first time I felt like I had made it. That was the single greatest accomplishment I ever had, and it was something that had eaten me alive for years. I had finished in second place at the Drake Relays three times. It is one of the biggest events in Iowa and is the biggest event for Drake University. It was always a dream of mine to win there. I remember after I won that I couldn’t sleep for a couple nights. I was so excited that I’d finally done it – I’d won. GCR: A year later in 2014 you won your third consecutive indoor 5,000-meter conference title in an indoor school record time of 13:59.71, then followed that with the 3,000-meter title. How tough was the competition and coming back in a second championship race? BA That was a pretty big weekend for me and that was the first season where I had felt good. I only lost one race the entire indoor season. I wasn’t getting in the fast heats because I didn’t have the fast times, but I wanted to qualify for indoor Nationals. We had a competitive conference. We had John Muskari and Ryan Weatherford. John was an All-American in cross-country and Ryan was a 28:40 guy for 10k. I had a stress fracture, but my physical therapist didn’t know that. I went in the week before and said that my leg was killing me. They worked on it and rubbed it. I told them it was not right, but they said I was going to be fine. I ended up winning the 5k and then the next day I could barely walk. They told me it was probably just a muscle. So, I ran the 3k and ended up winning. I think I closed in a 26 second last 200 meters and then I really couldn’t walk. I was limping everywhere and told the guys it wasn’t a muscle. I couldn’t even walk because it hurt so much. Then I got an MRI and, sure enough, it was a stress fracture. GCR: With all the racing you did, who are some of your favorite competitors from high school, college and currently at the professional level for their toughness or ability to push you to another level? BA In high school I really enjoyed racing Evan Seltzer and Johnny Fuller. They were from Winterset in Cornwood, Iowa. In college, John Mascari and Ryan Weatherford and I would always duke it out. I think John Mascari wins the title for beating us the most, but we did beat up on each other. Post-collegiately, I honestly just love to race. I love going to USA Championship events. Whenever I can beat a new person, I love doing that. I love battling it out with runners who have National titles or who are Olympians or any other top caliber of runner. It’s super special that we can have these race organizations and have these great events to pull us all together to compete. I’m still at a level where I need to rise up the ranks and to prove myself. I don’t have to worry about anyone beating me. I’m the one licking my chops and am trying to take down people. I’m a super competitive guy and just love that. Anything I can turn into a competition, I will do that. GCR: How was the transition after you finished up your collegiate eligibility and you moved on to grad school, you were coaching yourself, you didn’t have the structure of the collegiate racing seasons and you had to figure out what to do? BA Right after college there was this this running pro camp that was put on by the RRCA. I randomly stumbled upon it and asked my coach about it. The camp ended up being super legitimate. They flew me out to Washington, DC and gave me a heads up on the running world and what it took. Coach Ben Rosario from the Northern Arizona Elite team came out to talk. Tyler Pennell, who is a U.S. marathon champ also spoke with us. They sat us post-collegiate runners down in small groups and one-on-one and gave us the scoop on what to do. Then I connected with some coaches and they gave me some recommendations on what races I should do and how I should plan my racing schedule. So, I got super lucky. I just came across it on the internet and applied and was lucky enough to get in. They told me that I should try to qualify for the Olympic Trials marathon by running a fast half marathon. So, that was my initial goal. I planned to run some races on the U.S. circuit and then to run the Philadelphia Half Marathon to try to qualify for the Olympic Trials. GCR: When you competed at the Olympic Trials, how was it stepping up in distance to race your first marathon and then also to experience the excitement of the entire Olympic Trials Marathon weekend? BA It was unlike anything I’d ever done before. Believe it or not, I was injured going into that race and didn’t have any expectations. I wanted to go out there, enjoy the experience and try out a marathon because I had never run that far before. I was just trying to observe everything. I was like a giddy school child just being there. I remember in the warm up tents when Galen Rupp and Meb Keflezhigi walked in and there were camera crews following them everywhere. I felt so badly for them because I wouldn’t be able to get into the zone before the race if I had those distractions. They were being followed everywhere. There was a helicopter flying overhead for a newscast. I couldn’t take it seriously as it seemed so ridiculous. I couldn’t believe this was happening. I was near these great runners and was star-struck. I’d watched these runners on television and read about them and to be in the same race with them was super cool. The runners get to say they ran in the Olympic Trials which, for some people, is the pinnacle of their running and is a dream come true. To have that as my debut marathon was more than I could ask for. It was awesome. GCR: Now as you come off your big marathon win and fast time, and with the 2020 Olympic Trials marathon looming in the future, what will be your focus in 2019 in terms of improvement and how many marathons do you expect to put on your racing schedule? Are you looking to lay down a fast time early in the year on a course like London? BA My coach and I sat down to discuss the long-term goals and what our training calendar looks like. As soon as the U.S. Marathon Championships were over, I immediately started mapping out the marathon I could run and the races I could run. Coach immediately put that all on the kibosh. He said we’re not going to run another marathon until 2020. I was taken aback and said, ‘Why not?’ But he wants us to focus on training and thinks I can get down to 2:09 if we stick to the training and don’t slow ourselves down with another marathon race. With a marathon, there is a two- or three-week taper beforehand and then after you run the marathon there is a rebuilding phase that takes four to six weeks. I’m still recovering from my marathon and it’s been about five weeks. That’s his rationale behind avoiding the marathon. If we can be efficient with the remaining time we have in the next year before the Olympic Trials, we can get in the best shape possible. Then we can try to run fast there in 2020. GCR: When I read thoughts of some of the top marathon runners, even Kenyan athletes with sub-27:00 10k times, they talk of running their first marathon to experience the distance, their second marathon running for a fast time and then in their third marathon racing to win. You already got a win, so maybe your coach is correct, and you need to turn that a bit upside down and work to get fast now. BA I just know how to respect the marathon. I also understand that you need to take supplements and to get your nutritional energy during the race. Those are the basics for a marathon, and you can’t really tell someone, they need to experience that before they can make big gains. Otherwise you make big mistakes and they are painful mistakes. I agree with that analysis. GCR: Will your primary focus in 2019 be at distances from 10k to the half marathon and will you do any track racing to work on your 5k time and maybe even your mile speed to make yourself more efficient and your marathon pace feel easier? BA I’m planning to try to run a fast 10k and a fast 5k. I’m also going to compete in as many USATF events as I can. I’m planning to run the USA 15k Championships and USA Half Marathon Championship in the springtime. Ultimately, I hope to race at Stanford on the track and then compete in the Drake Relays 5k. GCR: Earlier you spoke of what you called ‘Goldilocks’ training and getting it just right. What can you do to tweak your health and fitness to help you as an athlete to stay on the right side of what I like to call the Two I’s – improvement versus injury – and get in a good, long training block? BA I feel like there are two components. The first is doing prehab, which is strength training and rolling out my legs after a workout, concentrating on recovery, getting enough sleep and eating the right things after a workout. Ultimately, there is going to be something that comes up and the sooner we can react, the better. For that second part I’ve been super fortunate this past season as I have a person who is a chiropractor and physical therapist that’s been able to diagnose situations quickly and then help me to rebound and avoid having it turn into a more serious injury. In summary, doing preventative measures and then confronting it can stop it from getting worse. GCR: For the runners I’ve coached, whether they were in high school training or cross country and track or adults training for road races, it was key that they understand that we have a goal races or races that may be six months away and there will be about sixty challenging days that will be long runs, intense runs or races. I always tried to convey that if we feel a tweak or a bit sick and miss one of those hard days, we will still be okay if we only have 55 hard days instead of sixty compared to going over the edge and missing a big segment of training. You’re a math guy - do you think in these terms? BA It resonates. I want to nip things early. I had my share of trying to train through injuries and it ultimately does not pan out well. GCR: You balance a full-time job with your extensive training schedule. What are the plusses and minuses of having more that is important in your life so that running isn’t all-consuming, but also having to spread your mental, physical and emotional energy? And do you see yourself possibly becoming a full-time runner for the next several years? BA I think it’s extremely beneficial to have balance in your life and to partake in more than one thing. I always describe it as a stock portfolio. If you invest all your savings in one stock and it does poorly, your whole outlook is poor. But if you invest in a bunch of different things you diversify your portfolio. If one goes poorly, your other stocks may do well. I feel it’s the same thing with life. If I invest everything into running and running goes poorly, then I’m going to have a poor mental outlook. And I’ve had that happen before. In college I got super depressed, but I did realize there were other things in life that were also important. I do want to be deliberate and take advantage of all the running opportunities I can, but I also want to be critically improving myself, whether it’s my relationships with my friends and family, whether it’s my career or any other extracurricular activities that I find enjoyable or that make me happy. I take if upon myself to challenge myself, not only in running, but in many avenues of life. That is extremely important to a happy life. GCR: With so many good distance runners in the United States it is so tough to make it into the top three in the Olympic Trials Marathon. As you look at the landscape before you, do you see yourself training strong for the marathon past the 2020 Olympic Trials and through another Olympiad to 2024 or will you just take it one year at a time? BA My goal as of now is to train for 2020 and 2024 as well. I feel like I’m coming into my prime marathoning now. I’ll be 28 years old in 2020 and 32 years old in 2024. I feel like I’d be disappointed in myself if I gave up on the sport before then. I still have a lot to give to the sport before I taper off. Meb’s been running a long time and I know it’s hard to keep up that training but, if he kept it up, he would still have a decent shot at making the team. I’m sure it’s something he questions. For me, I want to keep running for as long as I can. GCR: As an adjunct to distance running, I’ve read that your dad does the Leadville 100-mile bike ride every year and you crew for him. Do you think you could see yourself maybe running the Comrades Distance Run in South Africa or the Leadville 100-miler after your competitive marathon racing days are coming to an end? BA I think the mountain biking is extremely fun. I did a stint of mountain biking out in Moab and it was a ton of fun, until I crashed my bike and then it wasn’t as much fun. I think triathlons and mountain biking would be fun. I haven’t convinced myself to do any ultraruns, but someday I’ll slow down and maybe I’ll do some ultrarunning. I think everything is worth trying at least once. When you’ve done it, you will know if you like it and it’s a new badge you can wear. There are so many things in life to explore and I’d like to take advantage of as many as possible. GCR: My wife has a nonprofit that battles human trafficking, so I help with that. In the community over the years you’ve done projects like setting up a breakfast benefit to raise money for cancer patient's families, working with ‘Seeds of Success’ and as a handyman at an Iowa Shelter. How does helping others help you and do you see now with your title of U.S. Marathon Champion that you may be able to use the notoriety you’ve earned to benefit and help others? BA I think it is extremely important to help where you can. Doing those types of volunteer activities is also selfish in my regard because I like to learn and to experience new things. Sometimes those new things to help those who need help are new learning experiences for me. It helps me grow in certain ways. I want to help people have the same opportunities I have. All it takes sometimes is having someone reach out. I’ve done that a lot in my days and, most recently, I volunteered to scoop horse poop for a day. I went fishing with friends who let me ride their horses and, in return, I scooped poop for them. Things like that are super rewarding. You help someone else, maybe they help you out in return and it gives you lots of great life experiences. We only get one life to try to figure it out, so I try to take advantage of as many opportunities as I can. GCR: What advice do you have for younger runners to improve consistency, minimize injuries, reach their potential and to, hopefully, turn running into a lifetime fitness endeavor? BA From what I see most athletes doing wrong is not being deliberate enough in their training. For a time, I ran a lot of easy days and felt that I’d get better just because I was out running easy days. If you can be deliberate in training – you need to be doing mile pace work, you need to be doing tempos and hill repeats and all these different components of training. You can learn online or by watching others or learning from Instagram. The more you can be a student of the sport and take those lessons to apply to your training, the better off you’ll be. That’s something I didn’t learn until later in my life. Being deliberate and doing quality workouts two times a week and doing those long runs are super important for younger runners if they want to be better. Also, don’t be afraid to reach out for help. It’s super easy from what I’ve experienced. All you must do is ask questions and people are more than willing to help. GCR: Reflect on when you speak to groups about the major lessons you have learned about balancing aspects of life, the discipline of running, the patience of training many years with a goal, and coping with adversity that can help them to succeed. What do you share with a group of runners or just with a group of people that you want to help reach their potential as human beings? BA I contemplated and blogged about this the other day. The biggest piece of advice I would give to somebody is to set goals. This is the most important thing anybody can do if they want to have a fruitful and successful life. Set goals, whether they are a fitness goal, health goal, financial goal, or a career goal. If we don’t set goals, we just do all these random, miscellaneous acts and we don’t really go anywhere. Sometimes that may land us somewhere that we like and sometimes it lands us to do the same thing over and over and over. Then ten years, twenty years, forty years down the road, we may regret that. And maybe we won’t, but I feel that when you set deliberate goals to make yourself better and well-rounded, it prepares you to take anything on. Also, it helps you critically think about where you’ve been, where you want to go, and it helps you be more deliberate about how you can be better in the future. That’s something that I try to set. Every year for my birthday I create a year of bucket lists. For example, this year I want to save a certain amount of money for the year. I want to make twelve new recipes. I want to read twelve new books. I want to visit five new places. Since I have these goals, I have a sense of urgency to fulfill these goals. It allows me to grow as a person rather than taking life as it comes. Running heroes I always admired Meb Keflezhigi. After his 2016 Olympic Trials race, he was out there giving high fives to everyone and telling us, ‘good job.’ I went up to him and said, ‘Meb, you’re my hero.’ Then he said, ‘I’m not your hero. You’re my hero.’ I was thinking, ‘C’mon, Meb – just give me this moment.’ But it was funny. Meb is a great personality and he has been phenomenal for the sport in bringing the sport back and being a great representative for the U.S.